Fish, Plants & Coffee ! 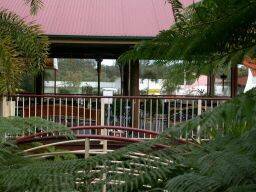 Lorikeet's Coffee Shop is situated around the main pond with running waterfalls and background music. It's the ideal place to relax in the soothing surroundings. Group bookings welcome for Seniors, Probus, Retirement villages and other clubs. Of course, it is an ideal place for your garden club. Lorikeet's is a great meeting place with plenty of variety in light meals including Foccacias, Tuna, Egg, Chicken, or Caesar Salads, as well as Gourmet Burgers and Quiches. Also choose from an extensive range on Gluten Free menu items. Be tempted by the large cakes and Cheesecake selection to go with a coffee. We serve Aromas coffee with their signature Espresso. Aromas are proud of their movement towards a sustainable future. Book in for a hearty Weekend Breakfast ! Start your weekend with a Lorikeet's breakfast from 8:00am Saturdays & Sundays! We also have our fantastic Midweek Breakfast starting at 8:30am - Monday to Friday. Our Breakfast Menu includes, Bacon and Eggs (Fried or Poached), The "Big Breakfast" speaks for itself with a generous serve of Bacon, Eggs, Toast, Sausages, Fried Tomato, and a Hash Brown. There's also Scrambled Eggs and thick Raisin Toast available. The Sunday Paper is normally available on the Magazine Table for reading. Lorikeet's has a relaxing atmosphere, and a heater is used for cold days. An extensive gluten-free menu is also available. Located halfway between Brisbane and the Gold Coast. Just 20 minutes from Brisbane CBD.